We’re often asked how we’re finding Montreal compared to New York, our previous home. I usually try to dodge this question by saying how much we’re enjoying Montreal and leave it at that. Let’s be honest, Montreal doesn’t have anywhere near the density of bars, restaurants, galleries and museums that NYC has. But the Big Apple has to cater to a population about 8 times the size of Montreal’s – to try and make a comparison is just plain unfair. That’s not to say it’s less fun here, the Montrealers know how to party and in fact it’s a lot easier to find where the action is since there’s really only a handful of hotspots. There also seems to be less people trying to be where you’re trying to be. The closest I’ve come to feeling like I was back in the New York was, bizarrely, turning up at Gordon Ramsey’s brand-new BBQ joint and being told by an eager-faced guy in the queue that it would be a two hour wait. Of course the cities do have their similarities, both being historic East-coast hubs for immigration. Both have their old brownstone buildings with metal fire escapes, re-purposed waterfronts and historic Jewish quarters. Montreal has Schwartz’s to NY’s Katz’s Deli. I had no idea that they even have their own version of bagels here. Often on our way home from the office we stop in at the famous Fairmount Bagels for a 6-pack of their wholewheat sesame. Boiled in honey-water then baked in wood fire ovens, they’re denser, sweeter and – I have to say it – perhaps even better than their equivalents south of the border. The Montreal bagel also claims to be the first bagel to have been into outer space. If the floor to our apartment is anything to go by, they’ll be finding those darned sesame seeds in dark corners of the Space Station for years to come. Another pleasant surprise is the thriving cafe culture. Montreal definitely punches above its weight when it comes to neighbourhoody cafes, owned and staffed by young hipsters, where you can uncover all sorts of cool concoctions like tea made with white coffee beans. Some are especially zealous in their pursuit of cool. 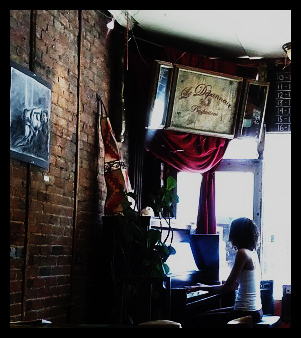 The Dépanneur Café, which makes the best grilled cheese and dijon mustard sandwich I’ve ever eaten, has a musical rota and it’s not unusual to have your lunch while being serenaded by a jazz pianist. The walls are adorned with charcoal nudes and vintage signs, the lamps are all antique and the stone tables covered with arty mosaics. The Plateau and Mile End is especially rich in this sort of establishment and the vintage aspect is not unique to the Dépanneur Cafe. There is a sense that history is cool right now. Vintage stores, called “friperies” line Boulevard Saint Laurent, which also happens to be one of the main clubbing hotspots. Casualwear for girl hipsters includes the kind of floral print dress a woman in a 1930s soap commercial might be wearing – except it’s more likely to be the very same dress from the commercial than a mass produced knock-off. The historic Jewish community, set in the middle of the Mile End and Plateau madness, certainly seems to benefit from young Montrealers’ cultivation of all that is older than them. We were encouraged to try out Wilensky’s where the menu hasn’t changed in 50 years and your soda is still made the way it was when the restaurant first opened in 1932: syrup poured in first, soda water on top and then hand stirred with a spoon. Ruth Wilensky, the original owner’s widow, works the wooden counter with gusto at an age when most of us would be dead let alone retired. This morning my Montreal-based cousin also introduced us to Beautys Luncheonette, an establishment that is only a decade younger than Wilenskys and also has an original owner still on the beat. He perches on a stool directing customers to seats, occasionally levering himself up to prowl the queue, looking for a group of the right size to fill the rarely-empty tables. That is clearly not a real NYC bagel in that picture! When you return to NYC you have to try a real egg cream soda, which will make that junk at Wilensky’s seem weak. If you let me know where you like to go for for a great bagel in NY, I’ll update the photo (and maybe my opinion! )… better still, fly over and show us! !